Any structure is only as good as its foundation. For a deep foundation to perform satisfactorily, it must have adequate geotechnical capacity to support the applied load and lack structural defects. If the foundation fails, it must be remediated or the structure demolished and eventually replaced. Either option is tremendously expensive. Therefore, it is desirable to employ construction control methods which demonstrate a deep foundation’s geotechnical capacity and structural integrity. For driven piles, a static load test checks the capacity, but due to cost and time considerations the number of static tests are generally very limited. Conversely, a dynamic formula is inexpensive and quick, but also notoriously inaccurate. 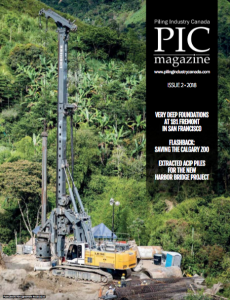 These considerations prompted research more than 50 years ago that resulted in dynamic testing, which can be applied at a relatively modest cost to a significant number of piles at multiple site locations to improve site characterization. 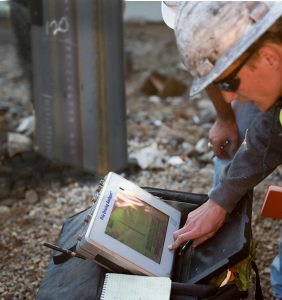 The Pile Driving Analyzer (PDA) with subsequent CAPWAP signal matching has become state-of-practice. Dynamic testing is also applied to cast-in-situ piles (drilled shafts, bored piles, CFA/augercast piles) by employing a drop weight of sufficient size. For larger projects, dynamic testing programs can optimize the foundation. Test program data can be used to select the best pile type and size by determining the geotechnical capacity at various depths and quantifying capacity changes with time (usually gains due to set-up) by testing both at end of drive and on restrike days, or even weeks later. Production piles are driven to criteria (usually a blow count tied to hammer performance) matching the successful dynamic test pile installation. Periodic testing during a long production pile installation documents that the hammer is performing consistently. For smaller projects, dynamic testing of the first production piles is generally sufficient to provide essential construction control criteria for the project. The cost of dynamic testing is a small fraction of static load testing costs, and is minimal when considering the potential savings. Lacking testing, the pile design must be very conservative and thus overly expensive. With testing, many codes allow lower factors of safety to be used for allowable stress designs (or higher resistance factors for LRFD) resulting in shorter piles, or fewer piles, reducing pile material costs which is the main expense of the foundation (Figure 1). 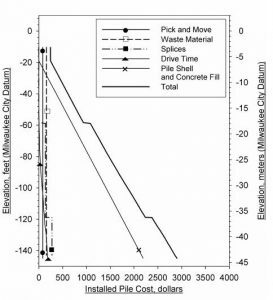 For example, the Ohio Department of Transportation (ODOT) tracked driven pile expenses over a six-year period (Narsavage, 2011). By dynamically testing typically two piles per foundation, significantly higher LRFD resistance factors (ODOT uses φ = 0.70; for D/L=3 the equivalent factor of safety is 1.96) were used for friction piles (piles not driven to rock) compared with a design governed by dynamic formula (φ = 0.40; equivalent factor of safety is 3.44). The resulting savings can be estimated at 43 per cent while the testing cost was only 2.5 per cent of pile costs, a small price to pay for such significant savings. The PDA also assists in evaluating driving procedures. Dynamic measurements allow the engineer to assess driving stresses during installation. This is particularly important for concrete piles where tension and compression stresses are critical. Knowing the concrete pile driving stresses allows the engineer to adjust the installation procedures, such as limiting hammer stroke height or changing pile cushion thicknesses to keep stresses under rational limits and reduce the risk of structural damage to the pile. Procedures can similarly be developed for steel pile projects where high compression stresses can be problematic. The PDA is used to detect if damage occurred on any pile exhibiting unusual blow counts or terminating at significantly different lengths. PDA testing information can be evaluated both for capacity and for installation procedures. Such knowledge is invaluable for a satisfactory final foundation installation that appropriately services its supported structure. Dynamic testing provides facts and reduces the potential risk of unsatisfactory foundation performance. Garland Likins, P.E., is one of the original founders of Pile Dynamics Inc. (PDI) in 1972 and was president of the organization from 1977 to 2014. In that capacity, he directed the research and development of transducers, real time processing equipment and software analysis programs for deep foundations. Garland remains a principal and senior consultant for PDI. He has a B.S. and a M.S. in Civil Engineering from Case Western Reserve University in Cleveland, Ohio and has achieved expert level on the PDCA/PDI Dynamic Measurement and Analysis Proficiency Test. He is a member of the American Society of Civil Engineers, the American Society for Testing and Materials, the Deep Foundations Institute, the Pile Driving Contractors Association and ADSC. Garland is a frequent lecturer and has more than 100 papers published in journals and conference proceedings. He is a licensed professional engineer in Ohio.